Lenses turn once more to the skies today as entries open for Astronomy Photographer of the Year. 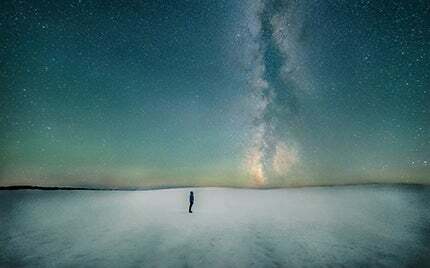 Winning and commended images in the four main competition categories – ‘Earth and Space’, ‘Our Solar System’, ‘Deep Space’, ‘Our Solar System’ and ‘Young Astronomy Photographer of the Year, as well as a handful of special awards, including one aimed specifically at newcomers to astrophotography. The overall competition winner will receive a prize of £1500, and category winners will receive £500. Runners-up and special prize winners will also receive cash prizes, and all winning images willbe put on display at an exhibition at the Royal Observatory Greenwich from September 18th, 2014 to February 2015. The 2013 competition produced a terrific crop of images, and the top prize was ultimately won by Australian photographer Mark Gee for his spectacular shot titled ‘Guiding Light to the Stars’ (above), which also made it into our picks for the best images of 2013. If you’re tempted to enter yourself and need some inspiration, take a look at our top picks from last year’s competition, and watch our video interview with competition judge Dr Marek Kukula. Astornomy Photographer of the Year 2014 is a joint venture between the Royal Observatory Greenwich and BBC Sky at night Magazine, and is powered by Flickr. Entries open on Thursday January 16th and must be submitted by April 24th 2014. To enter, visit www.rmg.co.uk/astrophoto.